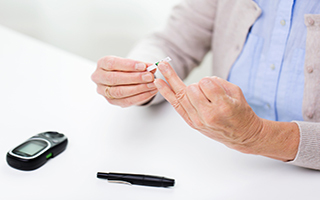 Is controlling your blood sugarreally this easy? If you struggle with your blood sugar, you know how difficult it can be to manage. Making sure you're eating the right foods at the right time is always on your mind. And you know that even if you're vigilant, you still may hear another lecture from the doctor next time you get your levels checked. But it doesn't have to be this way. There's a solution to these worries, and it can be found in the Himalayan Mountains. No, I'm not suggesting you move there to avoid the lecture! There's a plant that grows in this region that can have significant effects on your blood sugar — enough to ease your constant concerns and likely please your doctor. This plant is called Holy Thorn. Within this plant is a magical alkaloid, berberine, that doctors and researchers have known for some time has a very positive effect on fasting blood sugar, post-meal blood sugar, and A1C levels (your three-month blood sugar average). But until recently, they didn't know why or how it worked. Now a new study has helped identify the mechanism. Blood sugar becomes a problem when excess glucose builds up in your bloodstream after you eat. Your body has enzymes called AMPK proteins that help get that blood sugar to your muscles so they can burn it for fuel. These AMPK proteins get activated when you exercise, which is one of the many reasons exercise is so important. Otherwise, the glucose tends to stay in your bloodstream, where you don't want it. Unless, that is, you take berberine. Researchers have discovered that this extract also can switch on AMPK proteins. So you'll experience similar benefits to exercise, even when you're sitting on the couch. Of course, exercise has a host of other benefits, so this certainly isn't an excuse to quit being active and working out. But it can help your body continue to use up blood sugar throughout your day. While I want you to exercise, I know you can't spend your whole day at the gym. Studies have found that berberine not only helps your blood sugar levels stay in check, it can help lower LDL and total cholesterol, triglycerides, blood pressure, and even the number you see on the scale. Plus, it keeps your blood sugar levels more steady, so you avoid spikes and crashes that leave you feeling foggy and tired. Since you won't experience the crashes and cravings that drive you to eat anything you can get your hands on, you'll be able to make better choices in your diet in general. Even better, you'll have more energy to do that exercise that I'm not letting you off the hook for. If you're interested in experiencing these benefits for yourself, you'll find 1,000 mg of berberine in Advanced Bionutritionals' Mediterranean Cholesterol Formula. Many of my patients who take two capsules at night find that their blood sugar is lower by morning. Over time, this adds up to significant improvements.